Notes: Beets are a very healthy food. (BETA VULGARIS) Beets are packed with flavonoids. This is because it has the red pigment betaine. 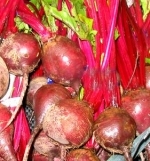 In experiments using beets, there were far less cancerous tumors appear in animals that ate beets. Beets had to remineralize the body, and this is especially important for women during pregnancy and menstruation where they need a lot of iron. Because of the folic acid content of beets, it is thought to make your skin look younger and healthier.